While I cannot take credit for the recipe for the flatbreads (all credit is due to Dan Lepard), I can take credit for the two awesome topping ideas I came up with recently: first, a flatbread topped with sausage meat and fennel and, secondly, a spicy meatlover’s feast. 1. 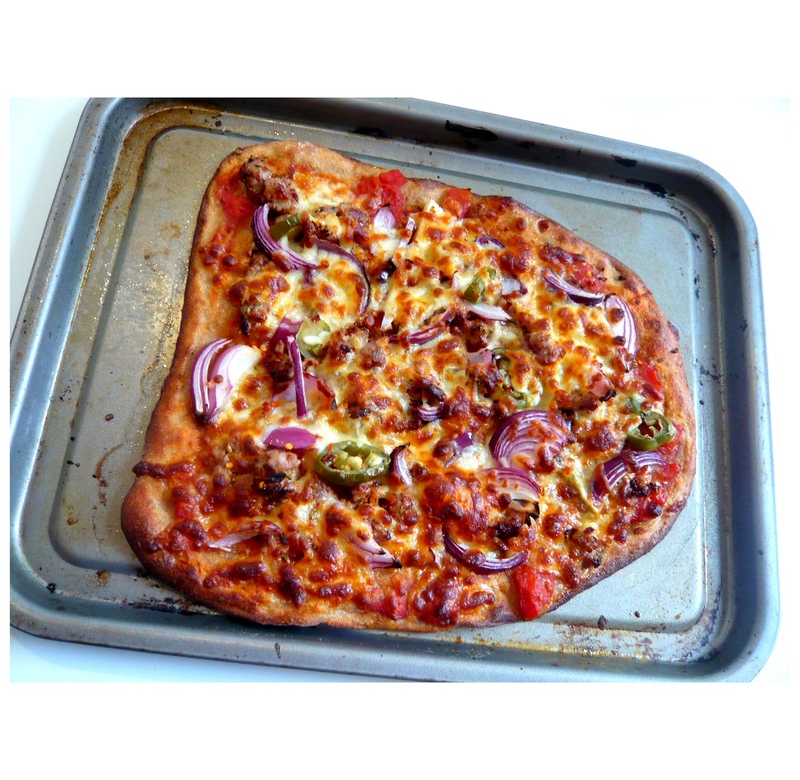 Once your flatbread dough is ready for us, roll out thinly and place on an oiled baking sheet. Pre-heat your oven to 250 degrees. 2. Heat a small amount of olive oil in a pan and crumble your sausage meat into the pan. Add the garlic, the sliced fennel and the fennel seeds and gently fry on medium heat until the sausage meat is cooked and the fennel has started to caramelise. 3. Carefully spread your cream cheese on your flatbread, being careful not to tear the dough. 4. 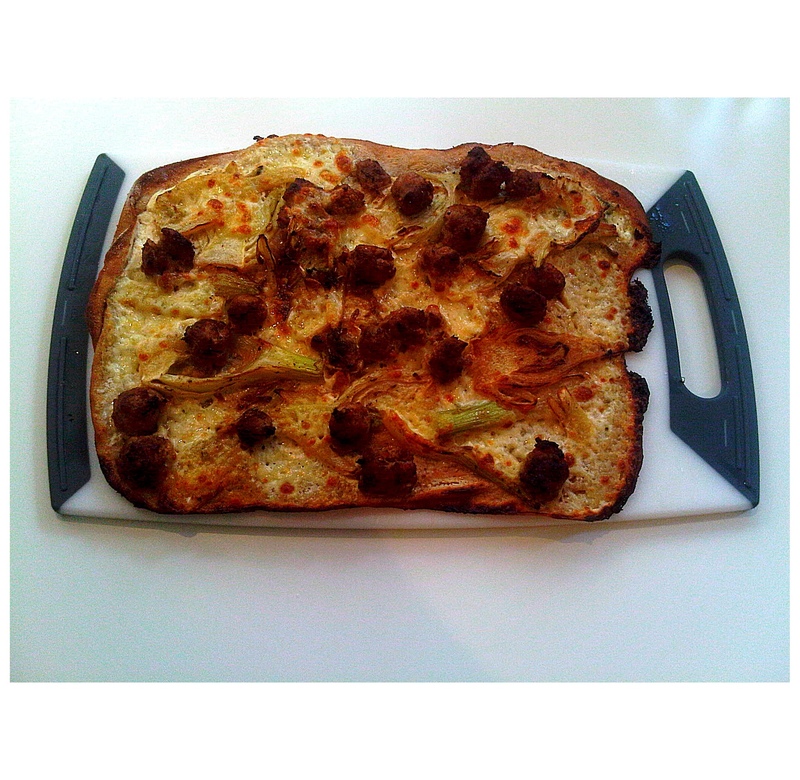 Scatter the sausage meat and the fried fennel over the pizza (discarding the garlic once you find it), spooning over many juices from the pan (no one said this was a diet-approved recipe! ), scatter with the mozzarella cheese and place in the oven for ca. 7 minutes until the dough is golden and the cheese is melted and bubbling. 1. Start by frying your sausage meat with the fennel seeds and a little olive oil on medium heat until the sausage meat is cooked. Add your chilli flakes and set aside. 3. Roll out the dough and carefully place onto a greased baking sheet. 4. Spoon the chopped tomatoes on the dough, scatter over the fried sausage meat, the jalapeños, the sliced onion and cover with grated cheese. 5. Place in the oven and bake for ca. 7 minutes until the cheese is all melted and bubbly and the crust has turned golden.